The most successful companies in today’s hyper-competitive world embrace change in every aspect of their supply chain. They view the supply chain as a dynamic asset that must be tailored to accommodate shifting customer preferences, new sales channels, and other promising opportunities. The ability to execute changes quickly is imperative to survival for modern businesses, but it’s only possible with the right operational solutions in place. 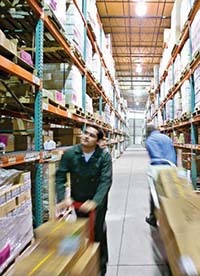 However, switching to a new warehouse management system can be daunting. There is often fear that a WMS project will be too expensive or the software will lack the flexibility to support the business long-term. And even if you think an updated system is mandatory, you must align everyone in your organisation – from top executives to associates on the warehouse floor – around this vision. While the new software will require an initial investment, finding the right system will save you money and put your company in a position to succeed for years to come. An effective change management strategy will empower you to build the case for a WMS, and after that, it will allow you to meet the ever-shifting customer and market demands that will allow your business to thrive. That has become a necessity in a marketplace where trends seem to appear and disappear in weeks or months – not years or decades. This eBook will lay out the steps your organisation should take to create a plan for change management, how to execute on that plan and finally how to sustain that approach so it becomes a core part of your business. It will also cover common pitfalls that could stand in the way of………………. Go here to read our eBook “How to stop avoiding your WMS project and embrace change”.